More than 1.5 million hands have held the pro-life brochures created by Linda Brenegan, former director of the Respect Life Office of the Archdiocese of Baltimore. The fetal development poster series that she painted hangs on 14,000 walls in 32 countries. At the Life is Beautiful Mass Jan. 14, Brenegan was honored with the Culture of Life Medal of Honor. 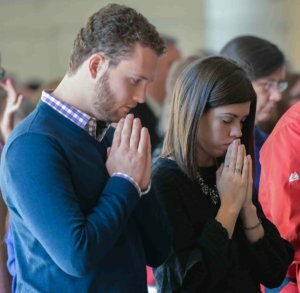 Archbishop William E. Lori celebrated the Mass, which was held at the Basilica of the National Shrine of the Assumption of the Blessed Virgin Mary, to kick off the week that will include the national March for Life Jan. 19. Those who are attending the march were blessed by the archbishop. Appointed to the Archdiocesan Respect Life Committee in 1995 by Cardinal William H. Keeler, Brenegan became the chair in 2005. 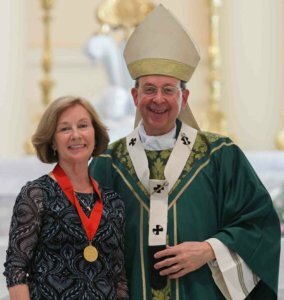 Her career in the archdiocese began in 2000 and lasted 16 years until her retirement. After receiving requests from multiple parishes, Brenegan set out to create fetal development posters to support the Spiritual Adoption program. Unable to find a willing artist, Brenegan used pastels to create her own medically accurate depictions of growing babies in the womb, called the Little One poster series. “God has a plan,” said Brenegan, who spent nine months painting during her nights and weekends, while holding down her full-time job. As of January 2018, the brochures and poster sets are in nine languages. 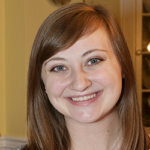 Brenegan and her husband started Little One Publishing to produce and distribute the posters and Watch Me Grow brochures, with parishes, schools, medical facilities and pro-life groups as customers. Even Hollywood has called. A studio representative asked Brenegan for permission to have her posters located in an upcoming movie, during an uplifting scene where a couple finds out they are expecting. Her favorite audience, however, was in Rome, when she presented her posters to St. John Paul II. 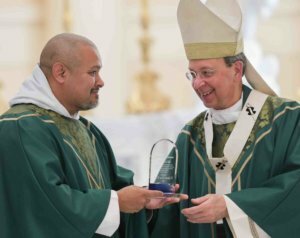 Franciscan Father of the Renewal Agustino Torres was presented the Life is Beautiful Award. He founded multiple nonprofits that help youth and young adults promote life. Father Torres is the host of Clic con Corazón Puro, a EWTN Español television show, and has been active in the creation of many programs of faith, healing, prayer and discernment. One person born in each year beginning with 1973 carried a rose to the altar ahead of the Mass in memory of those lost to abortion since the decision of Roe v. Wade. A pregnant woman held the final rose to her stomach for a child that will arrive in the year of the case’s 45th anniversary. In the pews were people of all ages and abilities. Barbara Gaver, who normally attends Mass at either the Shrine of the Sacred Heart in Mt. Washington or the Cathedral of Mary Our Queen in Homeland, attended with her son and daughter. Gaver’s son Sasha, who was adopted from Ukraine when he was two, recently began working at Chick-fil-A.